There are a few ways to concentrate the sun's rays into a single point to generate enough heat to ignite tinder. All of these methods alter the path of the parallel sun rays so they all converge at a common spot. By placing tinder at that spot and not accidentally blocking the sunrays, the heat is compounded enough to burn. When you look through a magnifying glass, an object appears larger because an area 1/32 inch in size at the focal point is spread across an area 2 or more inches at the lens, making something look 60x its real size. By having the sun's rays hit the lens all across its face, each of those rays will be redirected to the focal point. Instead of making something look larger, all the light and heat from the 2 inch surface are will be condensed into 1/32 inch area. making it 60x as hot. If the sun's rays are normally adding an extra 15 degrees to the surfaces they hit, 60x that would easily be enough to start tinder burning. In these photos, you can see the large bright spot at first as I find the focal point. The white spot should be the size of a pinhead, not a nickel like this. 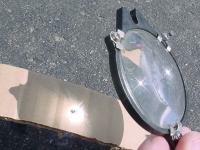 In the 2nd photo, the focal point is on the cardboard and you can see black burn marks. The spot is actually much smaller than it appears due to the camera's limits. I tried my glasses, but they are new plastic lenses and do not have a specific focal point. Clear water actually makes a good lens material. 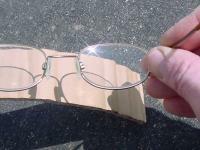 By filling a piece of clear plastic wrap with water and twisting it into a sphere, you can create a magnifying lens. The science, goals, and skills are identical to making a fire using a magnifying glass - concentrate the sun's rays to a single point where your tinder is waiting. Using a clear balloon works much better because the entire sphere is more smooth. In my experiment, the uneven plastic wrap made it very hard to get a single focal point as you can see from the strange, bright shape on the cardboard caused by the distortions in the sphere. You can turn and squeeze the water ball to influence its focal point as needed. You can see the obvious magnification in this photo. 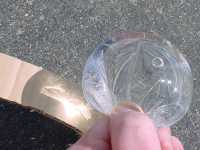 Identical to the magnifying glass and a ball of water, you can create a magnifying lens from ice. The problem is finding ice that is clear. Assuming you are in a cold, winter environment, you can cut a hole in lake ice and let it refreeze - the refrozen hole will tend to have pretty clear ice in it. If you wrap a layer of foil or plastic around the edge of the hole before the ice reforms, that will make it easier to extract your 'ice plug'. Once you have a chunk of clear ice, you will shave it with a knife into a sphere. Then, using your warm hands, roll the ball around and melt the surface until it is smooth. Use the sphere just like the fire by water technique. 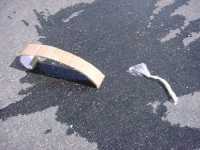 The big problem is getting clear ice, so if you are just experimenting at home, there's a shortcut you can take. 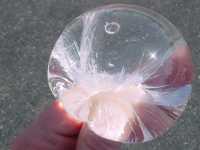 Make a water ball out of plastic wrap and water as described above. Tie it closed with a rubber band. Set the water ball in a cup or glass that it won't fall all the way down into. Put the water ball in the freezer or outside. Let it freeze until it has a thick shell of ice but the inside is still liquid. Remove the plastic wrap from the ice ball. Use your hands to melt and smooth the surface of the ice ball. 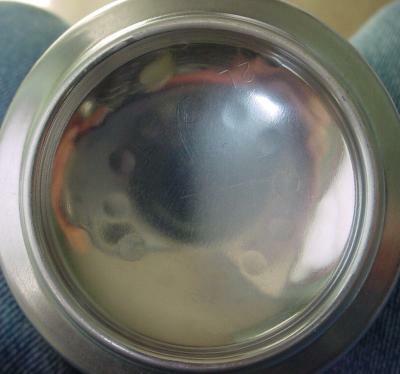 Now, you have an ice lens that is clear because the inside is still liquid and has not frozen 'milky'. 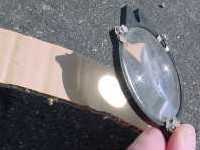 The other methods listed here have to do with using a lens, but this method uses a parabolic mirror to perform the same task of focusing the sun's rays on your tinder. 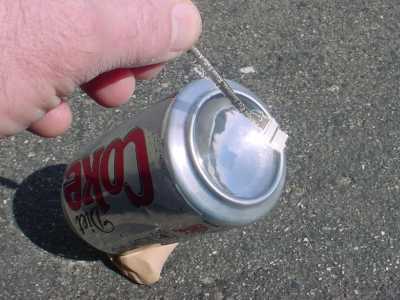 Start with an empty pop can with a parabolic bottom. 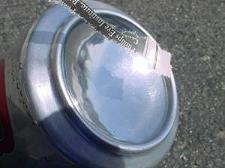 Polish the can bottom using 0000 steel wool - that is the finest grade. This will take just a few minutes of rubbing. 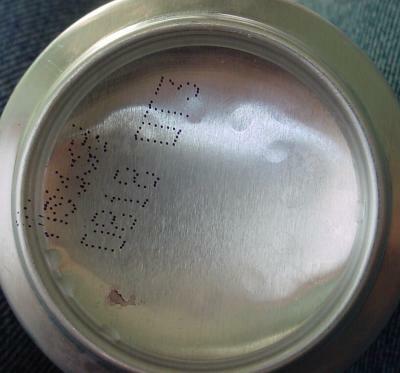 Notice the right-hand side of this can is not yet polished enough. When you can see your reflection, that is good enough. Take your pop can parabolic mirror outside in the sun and try it out. 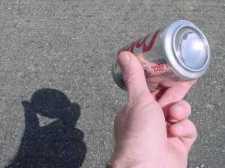 Position the can so the bottom is directly facing the sun. 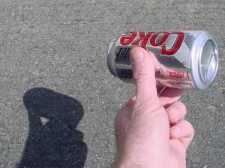 When the can's shadow is the smallest circle you can make, then it is in good position. Stick a chunk of tinder on the end of a toothpick or twig and position it at the focal point of the mirror and watch it smoke and glow. To find the focal point, move a small strip of paper closer to and further from the can until the reflected light circle is only a small dot and burns through the paper. That is the hottest spot.